I’m taking a pause from the Food Series to address what I feel is a timely and important issue in Haiti. The biggest disaster to hit Haiti is unfortunately not the earthquake, rather it’s how the Haitian people are responding to the circumstances brought on by the earthquake. I watch in amazement as events more deadly than the earth’s rumblings brutally strangle a country that is already on its knees economically and socially. 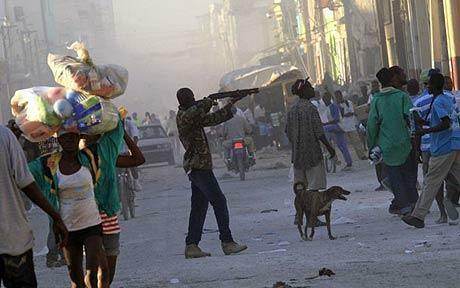 I’m sure that many of you are well aware that Haiti is classified as a “third world country” or otherwise known as “a developing country.” They have been plagued with poverty, crime, and political disarray from the beginning of their existence. Haiti is also no stranger to natural disasters. Every other year for the last 6 years, Haiti has been debilitated at the hand of a flooding, hurricanes, tropical storms, and quakes. And yet the government authority has never instituted ANY disaster preparation for their people. No community center or church within Haiti has tasked themselves with any preparedness learning or supplies either. The Haitians continue to eek out an existence learning the same lesson over and over again every couple of years. I don’t know about you, but when I seem to hit a continual losing streak over and over again, I finally figure out that I need to do something different. I feel very responsible for bringing peace and order back into my life. And when it comes to preparing for future scenarios of chaos, I take full responsibility for anything and everything I possibly can. I figure that I stand the best chance of being blessed with the miraculous assistance that I’m going to need to fill in the gaps. 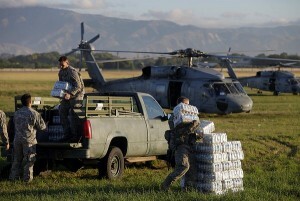 Haiti was receiving a great deal of economic assistance prior to the earthquake. 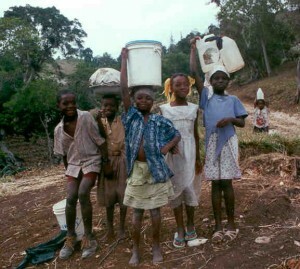 The majority of Haitians live on less than $60 a month. Home to about 9 million residents, two-thirds of Haitians are unemployed. There is very little public education offered. And they are working with an annual budget of less than $10 billion. Ironically, money coming from family members who are working abroad accounts for TWENTY percent of their economy. As a result of their continual bombardment of natural disasters, Haiti is very likely to default on their country’s recent $700 million in loans from Inter-American Development Bank. They have already been provided with half a billion dollars in debt relief. And to think this is just the economic scene. The lack of leadership in their nation is also a disaster of epic proportions. So much so that I’m struck with the irony that the destruction of almost every key political fortress is a most accurate symbol reflecting the present state of leadership and organization in Haiti. Truly adding insult to injury, the biggest danger to Haitians right now is the lack of leadership, order and preparation. The rule of law is a dark, black hole in Haiti. It is this absence of the rule of law that scares corporations from developing there. While the work is cheap, the vulnerabilities are too high of a risk for international companies to take, regardless of the short song they would pay for the manpower. This is why, nearly a week after the earthquake, their country has completely collapsed with no visible signs of recovery. How vital is it that a plan for preparedness is backed by direction and order in saving the Haitians? There are presently over 15 nations now coming to the aid of Haiti totaling over 1 billion dollars worth of necessary food, water, shelter, and medical supplies. Another several billion dollars has already been contributed in the form of manpower, expertise, medical assistance, shipping costs, and transportation. In other words, Haiti has received over 20% of their annual budget in just the past week. And yet we see their own desperation and misery damning these monumental efforts to save them and provide some comfort. The escaped prisoners have merely added to the scene of melee. Lawlessness has been destroyed on both sides of the line of justice. Is it any wonder that there yet appears no light of calm and order to shine on Haiti? Without leadership and planning, even the desperate cannot be saved. Sufficient leadership and planning are only brought about from the hearts of the courageous and believing. Only those who have stored up spiritual and mental strength in preparation for whatever shall attempt to conquer them can lead or be lead back to safety and peace. The healing which battered people need comes from order and a deliberate plan of contingencies. Peace cannot be dropped from an aircraft or donated in the form of currency. It must be stored up within our own souls for a time such as this. 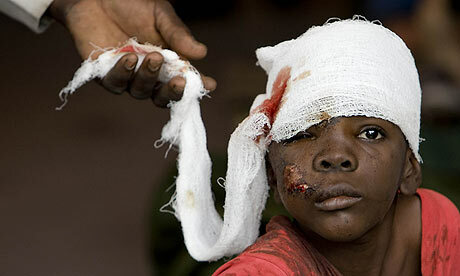 The suffering of the Haitian people as a whole is very real. But the resolve to put things back together must be stronger and speak more boldly than their desperation. Desperate moments are just that—small moments along a string of eternity. But we can sell away our eternal peace, dignity, worth, and our very souls if we fail to nurture our hearts and our minds more fully against a day such as this. The Haitians greatest needs must come from inside the people themselves. Such cannot be borrowed from a fellow virgin with a vessel of oil. I pray that we can all make use of this visual lesson which we have before us at the hands of a suffering nation. May we take more seriously the need for the spiritual and mental preparedness now which will inevitably be tested to the extreme… someday for all of us. Thank you Kellene. Over the last few months I have come to really understand what is meant when we are told (by you and others) that spiritual/mental preparation is a higher priority than temporal prep. Food and water is vital to survive, but mental/spiritual strength is absolutely critical to have the desire to survive. To be able to move forward. Once you have had a meal and are not desperately hungary, then what. Look at all the Haitians have to face once their hunger and thirst have been satisfied. My heart goes out to them. While my heart goes out to the Haitians (and the people of the Dominican Republic right next door), I am having a hard time working up any desire to send money or other aid – either individually or as a result of theft by Government (taxes). The country of Haiti HAD the natural resources to support its population until the 1920s, but they devastated their own land with short-sighted practices. They are a country dependent on charity. Continually. Neither they nor the UN has made any noticeable headway toward SELF SUFFICIENCY. They are like our banks that made a habit of bad decisions but got bailed out at the taxpayers expense. Haiti needs to use the assistance from others not just to live day to day, but to build up their farms once again, to route water to homes and crops, and to take other steps to making it a viable land. If the country cannot support life due to its condition or its people's mentality then perhaps it should not be inhabited. I am a firm believer in charity – as isolated acts of assistance to those who normally take care of themselves but have fallen on hard times for some limited period and need a hand getting back on their feet. Remaining in a condition where you must have others provide your support continuously is not something I see as Biblical or socially acceptable. Except of course, to political parties who trade life support for votes. I believe that self-sufficiency begins with mental and spiritual preparedness. You never cease to amaze me. I so appreciate the insight that you continue to bring to the preparedness mindset. It isn't just about food, water, means for security and shelter, but truly about being able to draw down the powers of Heaven when we need them. Heaven knows that the Haitian people are struggling and hurting, and we empathize with them. We give to help alleviate their immediate suffering but the cost to rebuild will be astronomical. Their leadership has been so corrupt and the people so beaten down that it is hard to think that it will be better with new buildings and infrastructure. I fear that most of what is given beyond day packs and bottles of water will be siphoned off to the remaining elitist (who weren't in the federal buildings that collapsed)and not be of benefit to the population as a whole. No doubt the UN will want to provide leadership and help to establish them under a one-world order. How incredibly sad! How I grieve for the people who are under such horrible conditions and seem to have so little capacity to do much to help themselves. May God bless them and provide for their needs. May we each learn from their circumstances and strive to elect honorable leaders who understand the righteous founding principles. In the interim, we need to continue to prepare against what may come so that we hopefully won't find ourselves waiting in long lines for a hand out but instead will be able to serve and bless others as we go about doing good. I believe FDR once said nothing happens by accident (not the earthquake itself), so in reference to the political turmoil that has been ongoing in Haiti, much of it is by design both from within and without. The one piece I have found odd, and perhaps I have not watched the news closely enough, is the Roman Catholic Church's lack of comment here. I was discussing with a RC friend of mine today and she was suprised that the Pope has not permitted the burning of bodies as he did with Katrina fatalities. The disease factor due to the decomposing and improperly buried bodies will unleash another devastation on this already tormented land. I have lived in a third world country, Nigeria, working poverty alleviation program and I have seen first hand how it is to live on less that $2 a day. It is hard for an individual family to prepare when they don't have enough for that day alone. Much of what you say is true but I will tell you that these people are extremely religious and spiritual. Most of the people go to evangelical churches and even the Catholic churches tend to be more evangelical with dancing and praise. Yes, there are a few that are caught up in Vodun Voodoo but that is not the majority so I feel that they are spiritually prepared. As for mental preparation, I think that a people that live in extreme poverty are already mentally prepared for extreme poverty. They are not educated and that is a mammoth problem to overcome as the government’s official steal the money that is to go helping its people. As for the Chaos that is happening, I sadly feel that it would be no different in the US if we were faced with no water or food and in some cases probably worse as most here are used to instant gratification and would find it hard to go without even for a day. I feel the majority of looting will happen with the aid monies that are being sent. The government, if there is one left after this, will become richer and the poor will remain the same unless there is supervision by the UN or US or another "developed" and accountable country. Charity is biblical and is a large part of Christian teaching. I can tell you that in a third world country if you become a widow and you live in a village you are basically doomed to poverty unless you can find a good husband again so they will be needing assistance for a long time. It is not like the US. I compare it to biblical times as it is not much different in the village or in the city for that matter. As for Orphans, How long do you take care of them one week one month what is your definition of limited time? "In the interim, we need to continue to prepare against what may come so that we hopefully won’t find ourselves waiting in long lines for a hand out but instead will be able to serve and bless others as we go about doing good." Barbera -- as with most posts mine, was imperfect in conveying my true intent. Orphans and widows are indeed mentioned specifically in the Bible as being appropriate objects of charity. The basic message I had hoped to convey was that Haiti (and other nations) that exist only because of continuous support from other countries need to radically alter their mindsets and actions. Yes, they have corrupt people in places of power that work at odds with this, but it can be done and history is full of examples. I am not averse to helping third world countries to build waterways, roads and install other “modern” amenities that will allow them to become self sufficient. But that MUST be the end game – become self-sufficient, not just a perpetual burden on others. I have a hard time with countries that do the exact same thing year after year, living hand to mouth based on someone else’s labors and don’t do anything to move out of that rut. In Bible times, it would not have been considered physically possible for one people group to help the widows and orphans on the other side of the world – it was up to people to take care of their own geographically local destitute. Haiti, with temporary help, needs to build up to a situation where they can care not only for themselves but for their own destitute. KB~ I always enjoy reading your blog. You have such nice, clean, cited photos that enhance your message. What they truly need basic property rights, education and rule of law. These folks have no incentive to work for anything because as soon as they get something they become a target for either thugs or the government to take it away. Preparing for long term survival actually makes them a target in short term survival. If you have nothing you are not a threat, and nothing can be taken from you. Jamie, unfortunately you are right and I have seen and heard about this happening often in third world countries. I had one young African boy ask me if neighbors in the US tried to kill me because I had more than them. I said no why you would ask such a thing. He said, "That is what happens in the village" He also told me they would try to destroy the person financially. I thought he was kidding and he assured me he wasn't. I know it sounds strange but it does happen all to often.